Gurkeerat Singh's all-round brilliance enabled India ‘A’ thrash Bangladesh ‘A’ by 96 runs in the first One-dayer of the three-match series, in Bengaluru, on Wednesday. The talented Punjab youngster first contributed a quickfire 58-ball 65 to ensure a commanding total of 322 for 7 for the hosts and then bowled his off-breaks effectively to return figures of 5 for 29 in 7.3 overs as the visitors were dismissed for 226 in 42.3 overs. The five-wicket haul is his best figures in List A matches. The last five Bangladesh wickets fell for just 19 runs to him. Much was expected of India's limited-overs’ specialist Suresh Raina, who played a competitive match after a three-month rest, but he was completely rusty during his 28-ball 16. 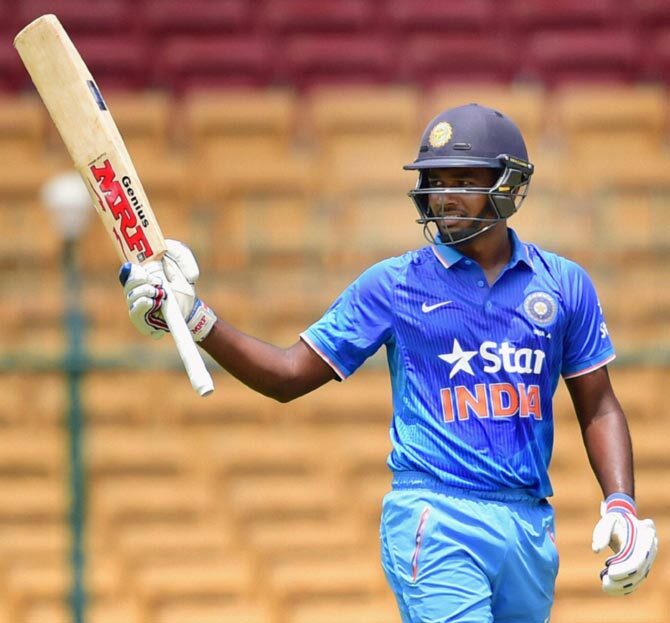 Gurkeerat, young Sanju Samson (73) and Rishi Dhawan (56) steadied the innings after India were reduced to 125 for 5 at the halfway stage. It was the 25-year-old Gurkeerat's second successive Man-of-the-Match performance following his unbeaten 87 which enabled India ‘A’ beat Austraila ‘A’ in the tri-series final. His 58-ball innings had nine boundaries; he added 102 runs in 14.5 overs with Samson and another 78 in eight overs with Dhawan, whose 56 off 34 balls was studded with eight fours and two sixes. Dhawan also did well with the ball, bagging two wickets for 51 runs in eight overs. 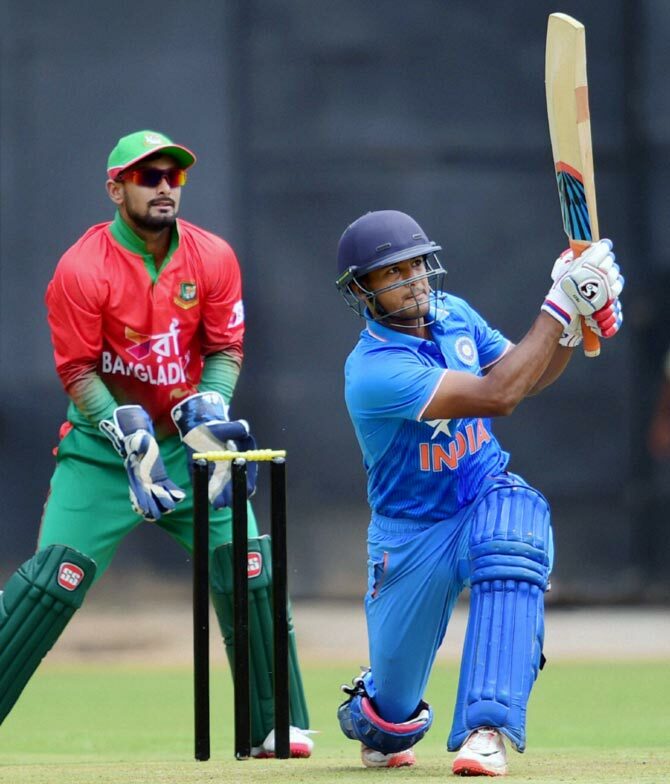 Put in to bat by rival skipper Mominul Haque, opener Mayank Agarwal (56) and Unmukt Chand (16) took the team's total to 44, the India ‘A’ skipper hitting four boundaries before Taskin Ahmed's extra pace induced him to edge one to Litton Das behind the stumps. Manish Pandey (1) did not last long as he edged one from seamer Shafiul Islam to Litton. Raina scratched around a bit, playing a few dot balls before he was fooled by a straighter one from off-spinner Nasir Hossain. 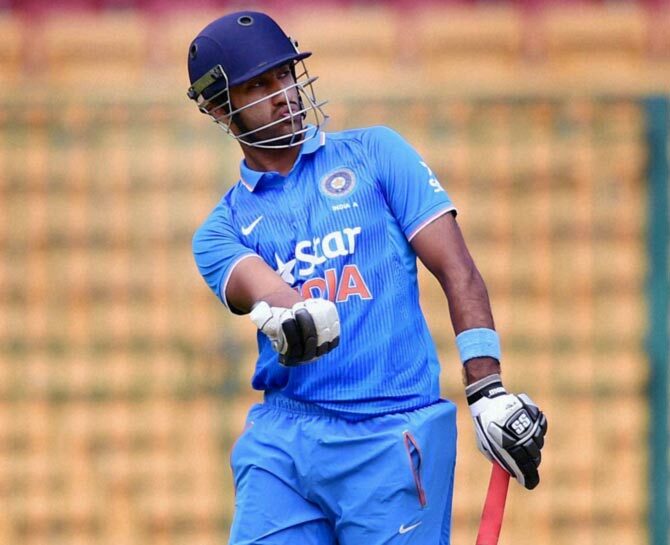 Kedar Jadhav (0) fell short of his crease before opening his account as India were reduced to 76 for four. With Samson, Agarwal steadied the innings, adding 49 runs for the fifth wicket as he completed another List A half-century. Having hit eight boundaries, Agarwal tried to force the pace, but holed out to Soumya Sarkar off Nasir's bowling. Gurkeerat and Samson then flayed the Bangla bowling with some audacious strokes and impressive running between the wickets. When Bangladesh batted, left-arm seamer Srinath Aravind made good use of his knowledge of the Chinnaswamy track and conditions as he swung a couple of deliveries back-to-back into the right-handers Rony Talukdar (13) and Anamul Haque Bijoy (0), having the former leg-before and latter bowled. In his next over, Aravind removed the dangerous Soumya Sarkar, having him caught by Jadhav. Rishi Dhawan removed skipper Mominul Haque (19) and Sabbir Rahaman (25) to make it 87 for five before Litton, with a run-a-ball 75, and Nasir, with 52, added 120 runs for the sixth wicket. At 207 for five, Gurkeerat weaved his magic, claiming the last five wickets fell for 19 runs in only 5.5 overs. Bowling: Taskin 5-0-46-1, Islam 10-1-60-2, Rubel 10-1-56-0, Sarkar 3-0-23-0, Nasir 9-0-51-2, Sunny 10 -0-57-1, Sabbir 1-0-11-0, Mominul 2-0-11-0. Bowling: Kulkarni 7-0-46-0, Aravind 8-1-29-3, Dhawan 8-1-51-2, Karn 10-0-53-0, Gurkeerat 7.3-0-29-5, Raina 2-0-14-0.